THPRD is always seeking responsible swimmers to join our lifeguard training programs. The following classes include American Red Cross certification. The district is always seeking motivated and responsible swimmers to join our lifeguard training program. Improve your swim skills, develop rescue and first aid skills, and earn certification that can help you land a lifeguarding job. Participants receive comprehensive training in the knowledge, attitude and skills necessary to prepare for the Lifeguard Training Program. Strong swimming skills required (Level 5+). 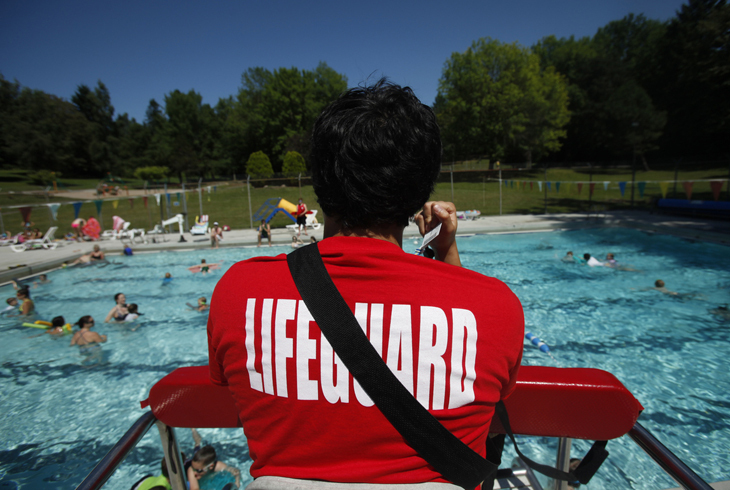 Volunteer lifeguarding opportunities are available for those who successfully complete the program. Swim 300 yards continuously, demonstrating breath control and rhythmic breathing. Complete a timed event within 1:40: start in the water, swim 20 yards, surface dive (feet-first or head-first) to a depth of 7 to 10 feet to retrieve a 10-pound object, surface and swim 20 yards on back with both hands holding the object, exit the water without using a ladder or steps. Successfully complete all required skill testing in CPR for the Professional Rescuer, First Aid and Lifeguarding certifications. Score 80 percent on the CPR for the Professional Rescuer and Lifeguarding written exams. The purpose of the review course is to give individuals with a current American Red Cross Lifeguarding/First Aid/CPR/AED or Shallow Water Lifeguarding/First Aid/CPR/AED certification the opportunity to review the course content within a formal course setting. Current American Red Cross Lifeguarding/First Aid/CPR/AED or Shallow Water Lifeguarding/First Aid/CPR/AED certification. Successfully complete all required skill testing in CPR for the Professional Rescuer, First Aid and Lifeguarding. Through video and hands-on skill building, the course includes all the water safety and drowning prevention tools and information needed to plan and conduct courses in American Red Cross Swimming and Water Safety program, including Parent and Child Aquatics, Preschool Aquatics, Learn-To-Swim, Longfellow's WHALE Tales, Safety for Swim Coaches, six water safety presentations and two water safety courses. Participants must be at least 16 years of age by last session. Successfully complete a pre-course skills test that includes front crawl (25 yards), back crawl (25 yards), breast stroke (25 yards), elementary backstroke (25 yards), sidestroke (25 yards), butterfly (15 yards), maintain position on back in deep water (float or scull for 1 minute), tread water (one minute). Attend and actively participate in all sessions (no make-up sessions). Complete reading and written assignments for each class. Participate in all water activities. Successfully complete four practice teaching assignments. Score at least 80% on written exam. Through video and hands-on skill building, the course reviews American Red Cross Lifeguard Training and prepares candidates to become Lifeguard Instructors. There will be multiple teaching opportunities for instructor candidates and feedback sessions provided by your peers and instructor trainers. The course will also give candidates the foundational information to teach Lifeguard Training, Water Front Skills*, Water Park Skills*, Aquatic Attraction Lifeguarding** (Water less than or equal to 3ft). *- must possess the base certification to teach class. **- must go through bridging course to teach class. Participants must be at least 17 years of age. 300-yard swim using front crawl, breaststroke, or combination of these two. Participants must demonstrate good breath control and rhythmic breathing patterns. Tread water using only the legs for 2 minutes. Lifeguarding skills evaluation: Participants must be able to demonstrate all skills to the standard demonstrated in training videos and instructor skill sheets.